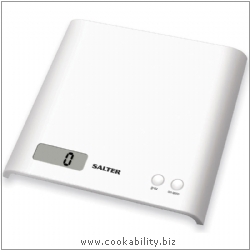 Salter is a British manufacturer of consumer electronic devices for personal and kitchen use. Weigh directly onto the platform or with your own bowl. Add and weigh allows for measurement of multiple ingredients in the same bowl - saves washing up. Easy to read LCD display. Switch between metric and imperial. 3kg max in 1g increments. 7lb max in eigth ounce increments. Requires 1xCR2032 battery, included.